Good afternoon, Insiders. 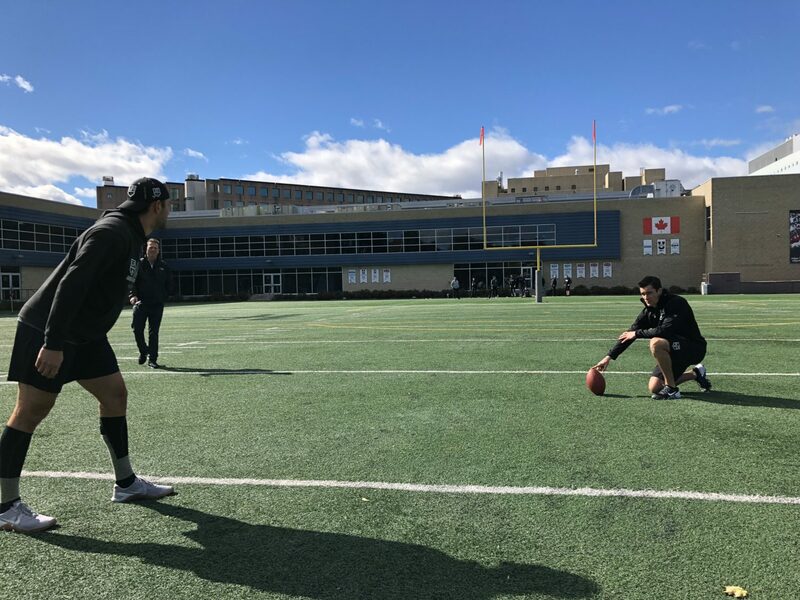 The LA Kings worked out at the University of Ottawa on– HOLD ON, ALEC MARTINEZ IS KICKING FIELD GOALS. This hastens the question: Who is the best raw athlete on the team? “I’ll let you guys make that assessment watching them [kick field goals], but it’s pretty clear some of those guys are athletes and some of those guys aren’t,” Stevens joked. –The Kings did not actually practice on Friday, one day before their game at 2:00 p.m. local time against the Ottawa Senators (FOX Sports West / FOX Sports app / LA Kings Audio Network). Generally, there are full-team skates the day before afternoon games, but at the mid-point of the trip, and after consulting with the training staff and being mindful of recent travel and the team’s regular practice schedule to this point, John Stevens made the decision to let the players replenish their energy in advance of Saturday’s matinee. They’ll have a good practice day in Toronto on Sunday. 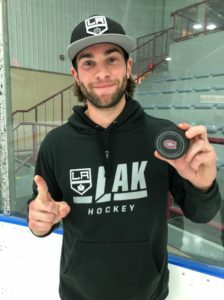 –Dustin Brown did in fact skate back at Toyota Sports Center today, and did so in his full gear with two Ontario Reign trainers watching from the bench. Again, he has to miss at least 10 games because he was placed on LTIR, but none of us are expecting to see him sidelined any great deal longer than that. I think the official term the team has used is “out indefinitely,” but you should see him relatively soon enough after those 10 games are up. Cody Ceci (upper body injury), Ryan Dzingel (lower body injury) and Alex Formenton (concussion) have been placed on the IR. Defenceman Christian Jaros and forward Nick Paul have been recalled from Belleville (AHL). “Who’s excited to see another Tkachuk play against Drew Doughty and the Kings?” asked no one in Los Angeles. Brady Tkachuk, the fourth overall pick this past June has two goals and three points through his first two NHL games. The Senators have averaged 3.75 goals thus far but are averaging a league-worst five goals against. It’s early; numbers are still wonky. The quick decisions and puck management issues are still there; the Kings would be wise to take a step forward in that respect Saturday before Monday’s game against the offensively elite Maple Leafs. –Adrian Kempe has been pretty good in three of the team’s four games this year, though that’s nothing out of the ordinary. Even when he hasn’t been scoring, he still plays an effective north-south game, and the Vegas series was a pretty good representation of this. But Kempe has terrific speed and the ability to beat goaltenders, and that scoring is welcome value to a team that could really benefit from it. –Tomorrow’s game will return Dion Phaneuf and Nate Thompson to Ottawa in the teams’ first match-up since last season’s trade. Thompson was a Senator for the better part of one season, but for Phaneuf, it’s his first return to face a team with whom he made a Cinderella run that ended in double overtime of Game 7 in the 2017 Eastern Conference Final when Ottawa was felled by a Chris Kunitz seeing-eye goal. “Ottawa is special to me for a lot of reasons. First and foremost, my daughter was born here,” said Phaneuf, who spoke highly of GM Pierre Dorion and the Senators fans, who welcomed him even though he joined the club from Toronto, a heated rival. Both Phaneuf and Thompson scored in the teams’ last meeting at Canadian Tire Center – though for the Senators. The Kings won 3-2 after Adrian Kempe’s tied the game late and notched the game-winner in the shootout last October. Though there is optimism ahead with players like Tkachuk, defenseman Thomas Chabot and forwards Alex Formenton, Colin White and Logan Brown, there were also reasons for negative headlines over the past six months, with Melinda Karlsson, Erik Karlsson’s wife, filing an order of protection against Monika Caryk, Mike Hoffman’s longtime girlfriend, and alleging repeated cyberbullying through a stream of disparaging online remarks. Neither player was interested in commenting on that dark chapter in Senators history. “I’m part of the Los Angeles Kings, and I think that’s in the past for everyone now, so I’m not here to talk about any of that,” Phaneuf said. Rather, while meeting with reporters at the University of Ottawa on Friday, Phaneuf shared many of the details that led to his February 13 trade to Los Angeles. He was aware that a trade was possible and knew one was imminent when he wasn’t getting any shifts midway through the Senators-Penguins game the night of the trade. “When I got sat down, I had kind of a feeling. I didn’t think I was playing that bad,” he joked. John Stevens has been appreciative of both players and praised Phaneuf’s personality, emotional investment and communication, noting that he’s a strong figure for the young players on the team. Phaneuf blocked four shots and issued three hits Thursday night, with Stevens approving the defenseman’s performance. He also logged 90 seconds of penalty killing time and was part of a group that faced an enormous array of shots, if not a great deal of scoring chances, during Jack Campbell’s first career shutout. As was noted by a reporter, it was Phaneuf that picked up the puck after the win to present to Campbell as a memento. Field goal practice at the University of Ottawa. From 32, Martinez holds, Iafallo kicks… just wide.